SRI RAMAKRISHNA'S SAYINGS ON " MAYA "
It is the veil of MAYA that keeps God hidden from our sight. The Universal Soul (Paramatman) cannot be realized till his veil is removed. The sun lights up the earth, but a small cloud will hide if from our view. Similarly, the insignificant veil of MAYA prevents us from seeing the omnipresent and all-witnessing Sachchidananda- Existence-Knowledge-Bliss. Well, what do you think of the nature of Maya? It is like the weeds floating on a pond. You can push away the weeds, but presently the cleared space will fill in again. Similarly so long as you reason within yourself and associate with holy men , everything seems clear; but shortly afterwards, worldly desires will throw over you the veil of illusion. But then, just as you could prevent the return of the weeds by interposing a piece of floating bamboo in their way, so also could you prevent the return of Maya by the fence of knowledge and love of God. In that case Maya could not make its way through such obstacles - Sachchidananda (Existence-Knowledge-Bliss) alone would be perceived. A certain Sadhu (saint) lived for some time in a room at the temple of Dakshineswar. He did not speak with anybody and spent his whole time in meditation on God. One day, all of a sudden, a cloud darkened the sky, and shortly afterwards, a light wind blew away the cloud. The holy man now came out of his room and began to laugh and dance. 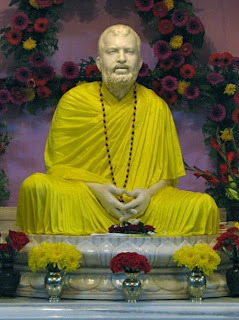 Upon this Sri Ramakrishna asked him, "How is it that you who spend your days so quietly in your room are dancing in joy and feel so jolly today?" The holy man replied, "Such is MAYA that envelops this life!" At first there is the clear sky, all of a sudden a cloud darkens it, and presently everything is as before once more. Maya is of two kinds-one leading towards God (Vidya-Maya) and the other leading away from God (Avidya-Maya). The former consists of discrimination and non-attachment. With the help of these the individual souls (Jivas) surrender themselves to the mercy of God. Avidya-Maya consists of lust, anger, avarice, inordinate attachment, pride, and envy. This kind of Maya gives rise to the sense of "I and Mine" and serves to keep men chained to the world. But as soon as Vidya-Maya manifests herself, all Avidya-Maya is totally destroyed. Ornaments cannot be made of pure Gold, some alloy must be mixed with it. A man totally devoid of Maya will not live more than twenty-one days. So long a s man has a body, he must have some Maya, however little it may be, to enable him to carry on the functions of the body. There are people who, although they have nothing to attract them in this world, create some attachment for themselves and so try to bind themselves to this earth. They do not want, and do not like to be free. A man who has no family to care for, no relatives to look after, generally takes a cat or a monkey or a dog or a bird for a pet object and companion, and thus slakes his thirst for milk by drinking mere whey. Such is the illusive power of MAYA. A patient is high fever and excess of thirst imagines that he can drink off quite a sea of water; but when that fit of fever goes and he regains normal temperature, he can barely quaff off a single cupful of water and his thirst is at once quenched with even a very small quantity of it. So an man being under the feverish excitement of Maya and forgetful of his own littleness, imagines that he cna embrace the whole of Divinity within his own bosom, but when the illusion passes away, a single ray of Divine light is seen to be sufficient to flood him with eternal Divine bliss. If you can detect and find out the universal illusion of Maya, it will fly away from you just as a thief runs away when found out. If the person, possessed by and evil spirit, has the consciousness that he is possessed, the evil spirit at one leaves him. Similarly, the Jiva (individual soul), possessed by the spirit of Maya, on realizing that he is self-deluded, becomes at once free from Maya. As soon as Maya is recognized, it flies away. what is the difference between Maya and Daya? Maya is attachment and love towards one's own relations and friends, - parents, brothers, sisters, wife, children, nephews, nieces and others. Daya is love extending equally to all beings; it proceeds from the knowledge that God abides in all.